At the turn of the twentieth century, objects relating to fishing, golfing, riding, and hunting became popular jewelry design motifs. Sporting jewelry appealed to men and women alike. 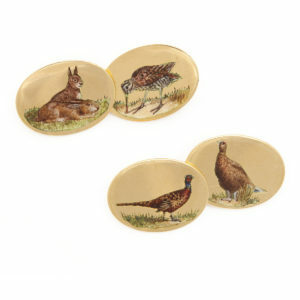 The dapper gentleman had a plethora of tiepins and cufflinks to choose from of this kind, likely admiring the riding and hunting references to English country life. The New Woman, too, adorned herself with sporting jewelry, emblems to the athletic lifestyle among her latest freedoms in breaking from the domestic realm, long thought her rightful place. 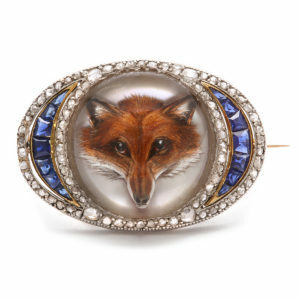 Fox-hunting was a particularly popular sport for the fashionable Englishman in this period, as only the fox remained of all the animals that could still be chased on horseback. The ability to hunt on horseback signified high status, as only the wealthy had such leisure time and could afford to care for horses and acquire the proper accoutrements. Much sporting jewelry featured reverse crystal designs, a jewelry making technique involving long and laborious handiwork. First, the cabochon form is cut and ground by hand. A draft in watercolor is made on the reverse, followed by scratching, and then engraving, the image into the crystal, before painting. The three dimensional effect created by this technique really brings the pieces to life. These charming pieces equally suit the sportsman of today, or the collector ever in search of history, who will appreciate these miniature pastoral scenes, the end of an era frozen in time.